This vegetable medley is one of my favorite ways to prepare vegetables in the winter. Stewed until soft and sweet, each vegetable seems to melt into one another creating a deeply flavorful dish. Try serving it over warm toasts, crackers or alongside a warm roast. The recipe is also adaptable, you can easily substitute or add in vegetables as desired. 1. Preheat oven to 400. 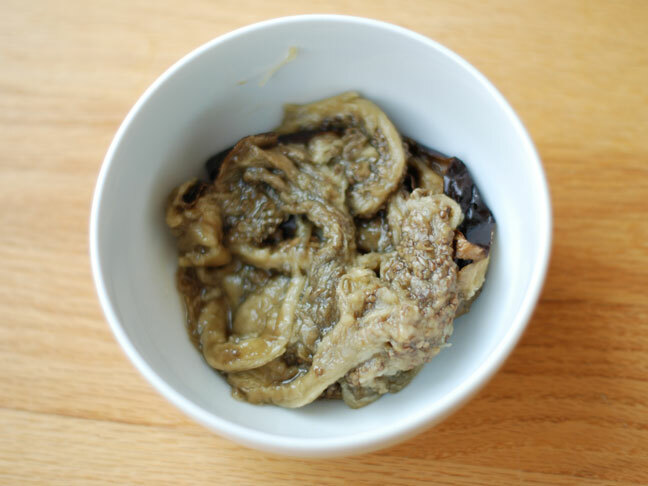 Toss cubed eggplant with olive oil and a pinch of coarse salt. Arrange eggplant evenly on a jellyroll pan and bake for 30 minutes. Toss the cubes halfway through to ensure even roasting. 2. Meanwhile, in a large Dutch oven or deep skillet warm 2 T. olive oil. Add zucchini and cook until gold brown and tender. Using a slotted spoon, remove zucchini and set aside. Do not remove the excess oil from the pan. 3. Add onion to Dutch oven and stir until softened – about 6 minutes – then add peppers and garlic. Stir occasionally until tender, but not browned. Add tomatoes, salt, thyme and bay leaf. Cook for 5 minutes on low. 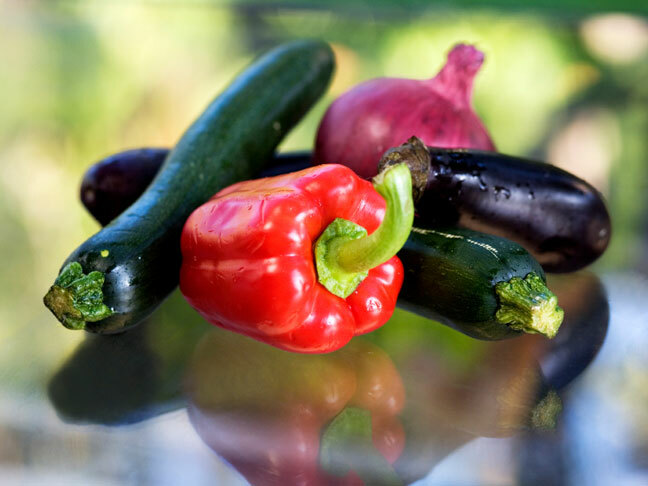 Add eggplant and zucchini, stir to incorporate and cook until all vegetables are very tender – about 20 minutes. 4. When all vegetables are soft and fragrant take a taste (don’t burn yourself!) and adjust seasonings if necessary. Discard bay leaf. 5. The finished Ratatouille can be served either warm or at room temperature. I like to eat it with bread and cheese for a midday meal.